- OVW Six Flags Summer Sizzler Series '06 (June 2) = The Throwbacks (Dice Domino & Deuce Shade) lost a "#1 Contenders Elimination" Match to the Highlanders. Casey James & Amish Roadkill were the other participants. - OVW Six Flags Summer Sizzler Series '06 (June 16) = The Untouchables (Dice Domino & Deuce Shade), Pat Buck, Jack Bull, & Rahim fell to Chad Runnels, Kasey James, Amish Roadkill, Chet The Jet, & Mo. - OVW Six Flags Summer Sizzler Series '06 (June 30) = The Untouchables, Vic Devine, the Miz, & one other won an "Elimination" Match over Elijah Burke, Kasey James, Chad Runnels, Shawn Spears, & Chet The Jet. - OVW Six Flags Summer Sizzler Series '06 (July 14) = The Untouchables competed in a "Tag-Team Gauntlet" Match, which was won by Shad Gaspard & the Neighborhoodie. - OVW Six Flags Summer Sizzler Series '06 (July 29) = The Untouchables beat Shad Gaspard & the Neighborhoodie. - OVW Six Flags Summer Sizzler Series '06 (August 11) = The Untouchables & The Spirit Squad (Johnny, Mikey, & Mitch) fell to Rob Conway, Danny Davis, Eugene Dinsmore, & the Basham Brothers. - WWE No Way Out '07 (February 18) = Deuce & Domino lost to the WWE Smackdown Tag-Team Champs, Brian Kendrick & Paul London. - WWE Vengeance '07 (June 24) = Deuce & Domino retained the WWE Smackdown Tag-Team Titles, beating Sgt. Slaughter & Jimmy Snuka. 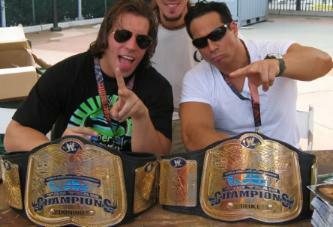 - WWE Unforgiven '07 (September 16) = Deuce & Domino lost to the WWE Smackdown Tag-Team Champions, Matt Hardy & MVP. - WWE Cyber Sunday '07 (October 28) = In a dark match, Deuce & Domino fell to Festus & Jesse. - WWE Royal Rumble '08 (January 27) = In a dark match, Deuce & Domino were beaten by Shannon Moore & Jimmy Wang Yang. - WWE Wrestlemania 24 (March 30, '08) = In a dark match, Deuce & Domino competed in an "ECW World Title #1 Contenders Battle Royal" Match, which was won by Kane.